✓ EXCELLENT REPLACEMENT PARTS! 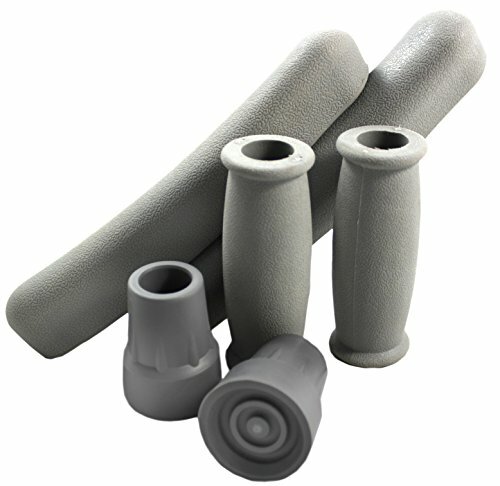 - Our crutch cushions make for exceptional replacement parts! Fits most standard aluminum crutches. ✓ COMPLETE SET! - Complete set includes (2) hand grips, (2) underarm cushions, and (2) crutch feet caps! ✓ LATEX FREE! - Made from high quality rubber materials, our cushions are latex free! ✓ DURABLE! - The thick rubber design allows for long-lasting use, and each cushion is textured for a firm, no-slip grip! ✓ EASY TO APPLY AND CLEAN! - The material is stretchy for easy application! Cushions can also be cleaned quickly with a little soap and warm water, if necessary.